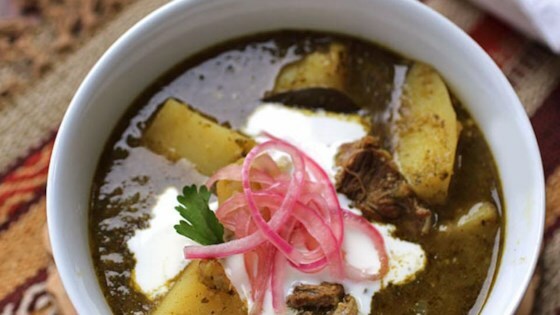 "This chili verde was one of the first recipes I ever learned. It comes out great even if you don't brown the meat, but I think doing so always adds extra flavor so I usually do it." Heat vegetable oil in a pot over high heat until it's nearly smoking. Add pork shoulder cubes in a single layer. Let sear until brown on one side, 4 to 5 minutes. Mix and turn pieces over and brown on the other side, 4 to 5 minutes. Add onion, 1/2 teaspoon salt. Cook, stirring until onions turn translucent, about 4 minutes. Add oregano, cumin, coriander, and cayenne. Stir and cook until seasonings get fragrant, about 2 minutes. Reduce heat to low. Remove paper husk from tomatillos and rinse. Cut into quarters. Place in blender with garlic, jalapeno pepper, poblano, cilantro, and chicken broth. Pulse on and off until pieces start to break down. Then blend until mixture has liquefied, about 30 seconds. Stir sauce into the meat mixture. Add 1 teaspoon salt and bay leaf. Increase heat to high and bring to a boil. Reduce heat to low to maintain a slow but steady simmer for about 1 hour. Add potatoes, 1/2 teaspoon salt, black pepper. If mixture has reduced to where potatoes are not immersed, add more broth to cover. Simmer until meat and potatoes are tender, 45 minutes to 1 hour. Garnish individual servings with a dollop of sour cream, some pickled red onions (if desired), and cilantro leaves. Check out this easy-to-make, deeply flavorful, pork chili verde. Regarding the pickled red onions I used on top of my chili: I was going to save this for a video, but it's so ultra simple that I'll just tell you right now. Slice some red onions, add a pinch of salt, and cover with red wine vinegar. Leave this overnight in your fridge, and the next day you'll be looking at one of the most gorgeous garnishes ever.